The Model 2500 PAV makes any other Phase Angle Voltmeter obsolete. With advanced DSP technology and Fast Fourier Transform algorithms this Phase Angle Voltmeter provides a new level of performance and versatility. In addition, the Model 2500 Phase Angle Voltmeter is considerably less expensive than any other traditional PAVs currently on the market. Specifically targeted at the Synchro/Resolver and LVDT/RVDT marketplace this Phase Angle Voltmeter makes measurements of Phase Angle, In-Phase, Quadrature, Fundamental and Total a breeze. All parameters are displayed simultaneously on a bright multifunction display. The readout can even be zoomed to enlarge any selected measurement. Isolated inputs allow null, ratio and gain measurements of key parameters and a reference offset facilitates bridging measurements. A sensitive null meter is included for precise nulling. 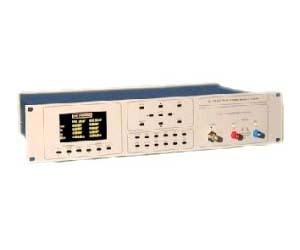 An on-board reference generator (with optional amplifier) eliminates the need for an external reference; although the unit can be used with an external generator if so desired. But the Model 2500 Phase Angle Voltmeter goes further. It can also measure complex impedance, power and harmonics, plot gain and phase over a selected frequency range, display input waveforms and show magnitudes of individual frequencies present in the input signal.